The Inquiry into the death of defected FSB agent Alexander Litvinenko concluded with a report, quoting his wife as saying that he either worked for the UK’s intelligence service MI5 or MI6. The report does not document but “implies” the direct involvement of Russian President Vladimir Putin. Among other by quoting Putin as having said that those who murdered Litvinenko were not God, and that Litvinenko obviously wasn’t Lazarus. Alexander Litvinenko defected from Russia to the UK in 2000 after an intermediate release from prison. The former KGB, then FSB officer was arrested on 25 March 1999. He was charged and detained in the FSB Lefortovo prison in Moscow. The charges against Mr Litvinenko were of exceeding his authority by assaulting a suspect. Litvinenko maintained that charges against him were false or trumped-up. He died in the UK in November 2006 after three weeks of illness. The cause of death was determined to have been polonium poisoning. It is noteworthy that the late Palestinian President Yassir Arafat also succumbed to polonium poisoning. Litvinenko was one of the former KGB / FSB officers close to the Russian oligarchs who secured the re-election of President Boris Yeltsin and usurped de facto power over many of Russia’s governmental and business affairs. Litvinenko was particularly close to the late oligarch Boris Berezovsky who also fled Russia after the election of Vladimir Putin to the presidency. Berezovsky made his first money selling cars and accumulated his first considerable “wealth” by defrauding thousands of investors in a Russian car production that never manifested. He was first introduced into the inner circle at the Kremlin during Yeltsin’s presidency, after a failed attempt on his life. The report resulting from the inquiry into Litivinenko’s death is widely criticized as being biased against Russia and Vladimir Putin. The Russian legislation is comparable to the US Presidential Order that allows the US President to sign daily “kill lists” and similar legislation in many other countries like for example Israel. One of the most controversial accusations Litvinenko levied against Vladimir Putin was that Putin and the Russian Security Services were implicated in the bombing of apartment blocks. Bombings which were then blamed on Chechen separatists to justify the war against Chechnya and to secure Putin’s power base by distracting from domestic political issues, said Litvinenko. 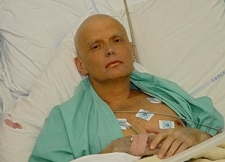 The report claims that the poisoning of Litvinenko with polonium “may” indeed have been carried out on Putin’s order. The report highlights a quote according to which Putin has said that “Those who killed Litvinenko were not God, and that Mr. Litvinenko obviously was not Lazarus”. The inquiry report quotes Litvinenko’s wife Marina Litvinenko as saying that Alexander had been working for one of the UK’s intelligence services. She wasn’t sure whether it was the domestic intelligence service MI5, the foreign intelligence service MI6 or for both. Marina would, however, stress that he was not “an agent” but had been working for them “as a contractor or consultant”.